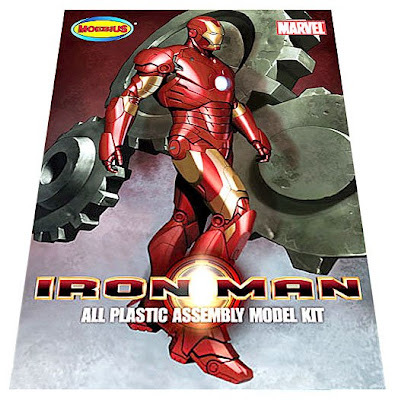 There are quite a few collectibles around for Iron Man, of Marvel comic and recent movie renown, but kits are not so common. 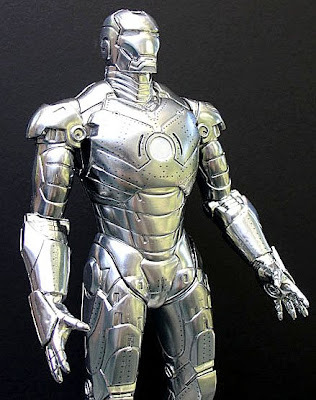 However, Moebius Models has a nice pair of Iron Man figures to build. The first Iron Man kit (top picture) is available now and stands some 230 mm (9 in) tall, on a rather tasty steampunk-style cogs-n-bits circular base. The Iron Man Mk II has a plated finish, and includes decals for the rivets. According to Moebius Models, the moulds for the kit are, “...engineered and cut directly from digital animation data used to make the Iron Man movie”, which sounds good to me. If you haven’t seen it already, the movie is well worth seeing. I viewed it again recently on DVD and it’s a tightly-edited production, deserving of the near-$100 million USD taken on its premier box office weekend. The drop-dead gorgeous suit itself sums up many of my wish-fulfillment fantasies; ho hum, what a shame it’s not for real. Scriptwise, I reckon the movie (starring Robert Downey Jr, Gwyneth Paltrow and Jeff Bridges) is somewhat deeper than the bangs ’n’ bullets trailer (above) indicates - or maybe that’s just me. You can buy the DVD from Amazon here, view the Moebius kit at the Forbidden Planet store here, or directly at Moebius Models here.